It is hard to think of a statement that encapsulates our worldview here at EntSight more than the above quote from leading digital analyst and thinker, Brian Solis. After all, understanding audiences and providing recommendations on how to drive value from them is our modus operandi. And why? Because our experience as digital and social media strategists has taught us that without this precise knowledge brands (and their agencies) only have assumption and conjecture to rely on - which rarely translates into success these days. What is 'Audience Intelligence' and Why Does it Matter? Audience Intelligence offers brands the opportunity to build a defined picture of their customers and potential customers in order to understand their preferences, habits and motivations and ultimately the best means to engage and inspire them. This insight can be applied across their business, from product research through to the development of the narrative and themes needed for impactful marketing content, and on to informing the precise media targeting now available to modern marketers. Brands who utilise this data and intelligence are able to speak directly to their audiences, ensuring a slice of the ever decreasing attention share that is available to them and can use the opportunity to drive value. Brands who do not and focus on addressing only broader audience groups and demographics with outdated methods will eventually find that over time they become less and less visible within an ever increasing digital noise. The simple fact is that, whilst the amount of content being produced for online and social media audiences is growing exponentially, the audience itself and their available time to view and engage with this content is not. This is the precise reason that social platforms such as Facebook have developed algorithms to ensure that only valid content reaches their users feeds. 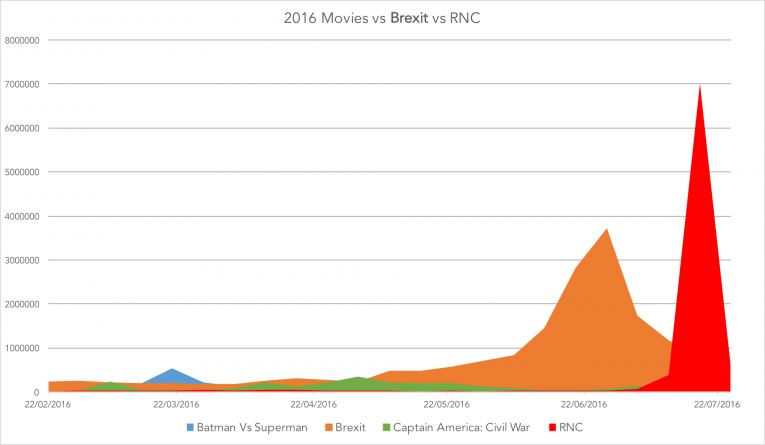 If this were not already enough of an issue for brands, a recent piece of analysis we ran confirmed that politics is currently dominating an already contested audience attention share - in some cases more than popular entertainment properties such as major Hollywood films. This is causing the window of opportunity to narrow even further since to try and harness political discussion and events is normally toxic to brands and therefore best avoided. The upshot of this situation is that brands can no longer rely on a 'broadcast' approach when it comes to driving value from audiences but instead need to focus hard on precision in order to cut through the digital noise - both in terms of the topics and themes of their content and the targeting of their media. Whilst most marketers understand that online and social media are now a necessity when it comes to engaging audiences, fewer are aware of the insights that can be gleaned from these channels. Therefore much of what is currently reported is simply performance metrics such as the number of likes and shares - which inform the success of your content but very little about your actual audience and what actually drives them. Here at EntSight we're able to identify useful aspects of brands audiences, such as their demographic makeup and location, as well as their preferences and consumer behaviours based on online and social conversations. This provides a level of accuracy and honesty not available in traditional panel based insights or focus groups where audiences are responding only to set questions, often in a controlled environment. - Which Brands Are Winning The Conversation in The Run Up To The 2016 Rio Olympics? - Which UK Marketing Websites Are Most Popular In Europe? - Which Are The Brands Ryan Reynolds Fans Love The Most? If there is one core motivation that drives us here at EntSight it is to ensure our clients understand the possibilities of a better comprehended audience and use the precise insights we're able to provide to build successful strategies and activations. After all, in an age where data allows us to understand even niche audiences behaviours and motivations, why are so many still concentrating on broad groups such as 'millennials' or 'affluent males'?